Faby dominates the early minutes of the match, but Tessa uses an opening as Faby makes a mistake to tie her up in the ropes and nail her, then turn her inside out with a backdrop suplex. Faby catches Tessa out of nowhere with an Indian deatlock, and Tessa escapes, but Faby drills her with a kick to the face and hits her implant Jay Driller for 2. Faby looks shocked that Tessa kicked out, so she takes her to the top rope, but Tessa shoves Faby off and hits a top rope Codebreaker for 2. Tessa hits the hammerlock DDT and gets the win. Great match, and Tessa looked awesome as always. Tessa gets a mic after the match to reaffirm that she is, indeed, the Knockouts Champion, and assert that she has run through the entire Impact locker room, and has now beaten the best in Mexico, and that makes her the best wrestler and the best athlete in professional wrestling. She is undeniable, and the one and only diamond of the Knockouts division. Taya Valkyrie appears on the screen and cuts a promo on Tessa in Spanish, and Tessa may think she's the best, but she can't say that until they face off. With that in mind, she proposes the two of them go at it with the Knockouts Title on the line at Bound For Glory. Even though everyone thinks Tessa is a b**** (Taya's words), she respects her because she's one of the best...but so is she. Eddie Edwards finds Alisha backstage and says revenge is in the air, and Alisha calls him crazy because he went out there to fight three guys last week. Johnny Impact comes in and suggests the two of them go against Moose and Killer Kross tonight, and where they are, "that little turdcutter" Austin Aries isn't far behind. Josh and Don talk about stuff, then we go to the oVe Cam, ans Sami says they sell out every show they're on, and tonight, it's Jake Crist's chance for the spotlight, because he's getting him a match against Brian Cage. Jake isn't cool with that, but Sami fires him up and now he's ready. Sami says Cage is getting his first loss tonight. Eli Drake is out on the town, and he convinces a taco vendor to come see him destroy a luchador next week. Cage picks Crist up and drives him into the corner, then nearly backdrops him into the next...wait, do they have ZIP codes in Mexico? Crist dodges a charge and Cage goes to the floor, where Sami runs him into the barricade. Back into the ring, where Cage kills Jake with a clothesline, a leaping knee, and a 619. Cage off the top with an elbowdrop for 2, but then Jake catches Cage with a series of knockout kicks for a very close 2 count. Cage hulks up, catches Jake running in at him, and hoists him into a drill claw for the win. Sami and Dave run in after the match and put the boots to him, and Sami stomps on his ding ding for fun. The lights go out, and when they come back up, it's...SABU! No, just kidding. Dave Crist is gone, with only his hat left behind. Pentagon and Fenix appear on screen in a dark room with what appear to be a couple of board, and they use them to work Dave over while Sami looks on helplessly. This gives Cage enough time to recover and lay Sami and Jake out with a double clothesline, then wipe them out with a dive when they scurry to the floor. McKenzie is backstage with Austin Aries and company, and Aries says he feels bad for Johnny Impact and Eddie Edwards, because they're facing Moose and Killer Kross tonight. Moose says Eddie is starting to annoy him because he thinks he's dangerous, but the truth is that they're the dangerous ones. Kross says he sees what Impact is doing, but everything he touches gets corrupted like a virus, and he can't let that happen because they have big plans for this place. Tonight, he's going to make him Johnny Neckbrace. Aries tells McKenzie she's done here, just like Johnny Neckbrace. GWN takes us back to the original LAX winning their first tag title, defeating Christopher Daniels and AJ Styles in Six Sides of Steel. Katarina finds Grado and Joe Hendry and says she's found herself missing Grado. They cut her off and start singing Access Denied, and she says she deserves it, but this was all just a classic case of wires crossed. Since they got on this big kick of trading gifts, she brought them one tonight: a psycho clown. She calls him a murderer clown, and the clown guy yells at them in Spanish, and Katarina says that means he's facing Joe Hendry next week, and Grado can come and watch. Rolondo Martinez welcomes us to the Smoke Show, and Scarlett Bordeaux has a big announcement. She got her own show her first night here, and she made hot shaming trend worldwide. She even almost made Fallah Bahh win the Impact World Title, so imagine what would happen if she put her focus on one person? She is issuing a global talent search, and the winner gets her attention...24/7. Well, I guess it worked for Matt Taven! Fast paced, flippy dippy stuff to start, then LAX hits a double suplex and Ortiz gets a no-arm splash for 2. This is non-title, by the way. The Babalu Boyz get a series of double teams of their own and trap Ortiz in their half of the ring, but he quickly makes it to the corner for the hot tag. The Hit Squad catches Santana on his own and hit a leg sweep/lungblower combo for 2, then a sitout powerbomb for another close 2. LAX turns it aruond with a rolling senton version of Poetry In Motion, then the Street Sweeper finishes it. Very competitive match. OGz appear on screen after the match, and Eddie Kingston congratulates them for a great win, then shows an old magazine of Konnan in his prime. He says Konnan was at his prime, but no more, because he lost his mask (Kingston has the mask and shows it), and this mask signifies what he was, but he lost that, and it was the beginning of the downward slide for him. He leeched off of Art Barr, he leeched off of Eddy Guerrero, and he's even still leeching off Rey Mysterio. Kingston realized Konnan was leeching off of him and put an end to it, and the two marks in the ring are the ones he's leeching off of now, and he just doesn't realize it. Kingston says he's going to end Konnan now, and he lights the mask on fire. We see KM in a neck brace in a pink princess bedroom, and Fallah Bahh is reading him a bedtime story, then he sings a nursery rhyme (with the words "Fallah Bahh, Fallah Bahh, Fallah Bahh Bahh...BahhBahhBahh...). Once KM is asleep, Bahh puts his robe over him like a blanket, kisses him on the forehead, and tries to tip toe away when KM says he has one thing to take care of, and that's revenge. Tessa Blanchard is backstage, saying Taya Valkyrie just happened to disappear from Impact when she showed up, and now she magically shows up and makes a brave challenge from thousands of miles away. And if Taya wants to call her a b****, she'll show her one at bound For Glory. Allie and Su start us off, but su quickly tags out to UMoH. UMoH just unloads on Allie, but Allie takes her out with a clothesline and a cover for 2. Allie and Kiera with a series of double teams for 2. Su tags in and takes control on Allie, and now she's caught in the wrong part of town. Allie breaks away to make the hot tag, but UMoH yanks Kiera off the apron, and Su drills Allie with a palmstrike for 2. Double clothesline wipes both ladies out, Kiera avoids Su's attempt to knock her off the apron, and Allie makes the hot tag. Kiera cleans house on Su, and a snap bulldog gets 2. Allie and Kiera absolutely DESTROY the UMoH, Su gets the mandible claw on Kiera, Allie breaks it up, and Kiera gets a swinging fisherman buster on Su for the win. Really good match, and a big win for Kiera Hogan! Definitely her biggest moment to date. Matt Sydal is meditating in front of a psychedelic building, and it actually shows his third eye open on his forehead, but Rich Swann comes over and pokes him in the third eye and says he's done with the games. He's rady to whup that a$$ here in Mexico, so next week, he wants Sydal to be ready. Sydal watches him walk away and reopens his third eye. And with that, it's main event time! Kross and Moose tag in and out before making contact to frustrate Eddie. Kross finally grabs Eddie, but now he tags out to Impact. Kross corners Impact, and he and Moose double team him as we go to commercial. We're back as Eddie makes his way into the ring, but is quickly drilled into the mat with a spinebuster from Kross, and now he's in trouble. Eddie tries to fight his way out, but Moose drills him with a standing dropkick to shut that down. Kross with a giant swing, but Eddie gets away and makes another hot tag. Impact gets Kross down and goes for his twisty top rope elbow, but Kross rolls out of the way, and he and Kross lay each other out with a double clothesline. Hot tag #3, and it's Eddie and Moose. 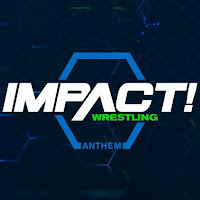 Kross and Impact go to the floor and Kross whips Impact into the crowd, but he lands on the guardrail, then comes back and hits his rolling neckbreaker thing on the floor. Back in the ring, Eddie hits a Blue Thunder Bomb on Moose for 2. Moose drills Eddie with a headbutt, Impact superkicks Moose, Kross clotheslines Impact, Eddie hits an enziguiri on Moose, and everyone's down. Everyone except Austin Aries, who gets into the ring with belt in hand to take a swing at Impact, but Impact grabs the belt and nails Aries with it. He holds the belt up and plays to the crowd, and doesn't notice Kross as he comes in and hits a backdrop suplex. The ref gets rid of the belt as Eddie drills Kross with the kendo stick, but Moose hits the spear on Eddie, and that's all she wrote. Really good main event to close the show.